KitKat in Brazil surprises its young target market by introducing an exclusive pillow notebook. This promo gift makes everyone crave for more Kitkats so they can get their hands on this exclusive merchandise. The main feature of this notebook is the inflatable cover. The material is quite similar to the material used on inflatable mattresses. How KitKat benefits from this exclusive pillow notebook? The brand carefully thought about its target market, which is mainly young people. The brand knows its consumer’s behaviour. Hence, they’ve created this great promotional item. This item is pretty innovative since customers uses the notebook normally. Once, they’re done and got tired, they can easily switch the study notebook to a comfortable inflatable napping pillow. Imagine napping on an inflatable pillow right after a hard day’s work. These features fit the needs of most hardworking young people. Also, who doesn’t love an energizing nap? 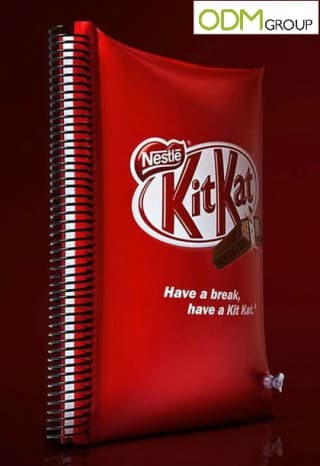 An inflatable cover for a notebook has been the result of a really successful campaign for KitKat in Brazil. The brand saw a significant increase in their Facebook likes compared to their regular posts. Why do we love this promotion from Kitkat? Unique – First of all, we need to mention that this product is pretty outstanding. It is incredibly unique and fresh. The idea behind this promotion addresses the needs of the brand’s target market. Like who would have thought of creating a notebook that doubles as a handy pillow. Certainly, this will make waves in the promotional market. Branding – It has good branding potential since the front part has a wide area for printing. As seen on Kitkat’s example, they utilised the front cover to promote their brand. If you want to see another sample of using notebooks as a promo item, check out the link below. Overall, this item is an interesting promotional item for brands to use. We highly recommend using this product as this sparks interest for your customers. Should you want to know more about this item, feel free to contact us anytime. Our team is always ready to take your marketing and manufacturing queries. These are great pencil cases. Could really use this for brand promotion. This promotional tool is perfect for high – traffic public areas. Doing this increases brand value.